Homelessness has been an issue in the Bay Area and for some residents in San Jose, they say they feel like prisoners in their own community. Neighbors have witnessed drug dealing, fights, break-ins and even prostitution. Damian Trujillo reports. Several San Jose residents said they feel like hostages in their own neighborhood due to the city's growing homeless problem. "It’s like we are the prisoners and they’re the guards," said a San Jose resident who did not want to be identified. "It shouldn’t be like that for anybody." 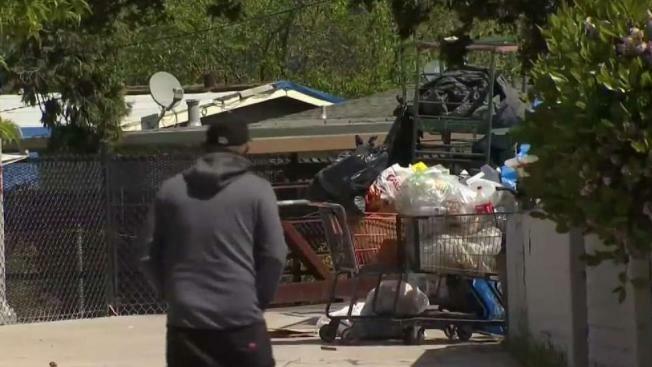 Along Capital Expressway near Story Road in San Jose, locals say the homeless have taken over sidewalks and parts of the neighborhood, and are fearful when walking in their own community. Neighbors say they have witnessed drug dealing, fights, break-ins and even prostitution. After three years of complaints, residents say they have had enough and are demanding action. City officials said a homeless street outreach team has been sent tout to assess the areas, and offer shelter and services to those in need.